Indonesian Insights – Everything You Need to Know When Planning a Bali Getaway | Have you been dreaming about your next vacation? Perhaps somewhere tropical and exotic, like Bali? With stunning beaches, an interesting culture, world-class surf and plenty of opportunities for exploration, it’s no wonder this little slice of paradise is a popular choice for Aussies. If you’re worried that Bali might be out of reach financially, well think again. Latitude Finance are travel loan providers who can help you finance your next dream vacation. And once you have your finding secured, all you have to worry about is booking your flight, packing your suitcase and getting yourself to Indo. Continue reading below for some great tips on planning your getaway to the beautiful island of Bali. The peak season and most expensive time to travel to Bali is July and August. The rainy season is from November through March. So the best time would be between September and November, or April through June to avoid the larger crowds and higher priced accommodation. The weather is tropical and warm year-round so it is the perfect getaway when the weather’s not as inviting back home. If you have a long flight and many hours of jet lag, you’ll want to stay at least a week, if not two. Bali has incredible scenery, hiking, beaches, surfing, resorts, and more to make it a completely worthwhile holiday destination. ● Fly into Denpasar airport, and then spend the first night or two nearby. ● Seminyak is convenient to the airport and very busy. ● Sanur is a more laidback stop off before exploring nearby islands. ● Canggu is the place to go for surfing and just a little further from Seminyak. ● Avoid Kuta as it does not have a typical Balinese feel and is much more commercialized. 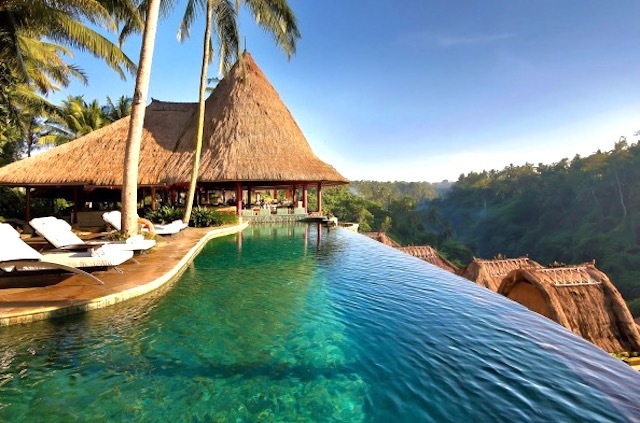 ● Ubud is a great stopover, about an hour north of the airport. It is near the Monkey Forest, Mt. Batur, and full of cultural ambience with its temples and local markets. ● For a luxurious experience, head for Nusa Dua, the beautiful beaches and five-star resorts at Western prices. To save a little but stay near Nusa Dua, Tanjung Benoa is only a few minutes away by taxi. You can purchase a day pass to one of the luxury hotels and still have a great experience at a fraction of the cost. There’s something for every type of itinerary and taste. From the health-conscious to the party-hopping to the surfer or a family beach holiday, Bali has become a very popular tourist destination in recent years due to lower flight prices and more accessibility from all over Australia. Sanur has calm beaches for small children and a relaxed atmosphere. For older children interested in surfing, Canggu and Seminyak have surf schools and more active beaches. There are plenty of water activities, water parks, canyoning, and wildlife parks to keep the whole family entertained. The scenery is stunning and the landscape enchanting. There are so many magical parts of Bali to discover as a couple. Romantic candlelit dinners, a sunset cruise, enjoying a sunrise in the mountains together, or walking along one of the many beautiful beaches are just a few ways to spend time together as a couple. Made famous by the “Eat, Pray, Love” book and movie phenomenon, Bali is indeed a wonderful place to explore solo. There are many ways to hit “restart” on your life in Bali. A spiritual retreat, time with nature, away from the hustle of your regular life, a solo trip may be just what is needed to recharge and maybe even reevaluate life choices. No matter what your reasons for a getaway to Bali, there really is something for everyone. Solo, couples, families, or friends can find amazing culture and enjoy wonderful landscapes to revitalize and refresh before returning to normal life. Photo Monday - Introducing You Orang Utans!